Unbelievable price, can't even get a black cab in London these days for £20! Cheap decent hotels available this time of year too as out of season / just starting. Weather in that part of Spain can be a bit of iffy that early in the season.Still a great price tho. Weather in that part of Spain can be a bit of iffy that early in the … Weather in that part of Spain can be a bit of iffy that early in the season.Still a great price tho. It might be better than here though. Same price if you want a shorter break (4 nights) returning on Sat 27th. Voted hot, great deal. Last year on beginning of May I went for exactly same trip with Ryanair. It was first May Bank Holiday weekend and weather was really good (25C everyday). I have stayed in Salou at the sea side & water in sea was warm enough to have a bath. There is a great theme park - portaventura.es. You can also catch a bus to Barcelona. Great deal! Same price from Liverpool Sat 20 April to Sat 27 April. Went to Salou last year. Not a bad place, had some development during the 92 olympics so has a good promenade, a bit of history surrounding it (tarragona) and superb beaches. We went in late may time and the weather was unbearably hot at times, but did rain a couple of days. Barcelona is up the coast about an hour away by (relatively cheap) train, one of my favourite cities. Voted hot! WOW! They must be selling at a loss. It was only about £36 for return flights Bristol to Reus on the same dates, I saw the other Salou deal and tried some dates. Anyone stayed there? I was looking at the Magnolia hotel, total cost for 2 (B&B and flights) worked out about £445 in total! Same price if you want a shorter break (4 nights) returning on Sat 27th. … Same price if you want a shorter break (4 nights) returning on Sat 27th. Voted hot, great deal. Returnnig on Saturday, are you real? Booked! nice cheap break now to find a cheap room and parking.... any ideas folks? 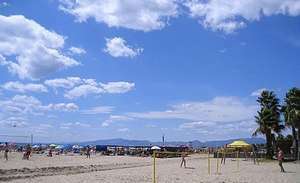 I went to Salou in April - temperature is just right (around 20) and no rain when I was there! Lovely place, not too far from Barcelona town centre. its showing me £45? wat am I doing wrong? Annoying that everything is always dearer from London! fantastic deal,been here quite a few times. don't bother with transfers as a taxi will be uncer 20euro each way. check alpharooms for cheap hotels as there are loads on there. my recommended hotel is the h10 dolphin park. Don't fall for it they always need to add extras,tax,luggage etc it'll add up. Prefer full service airlines myself, but in fairness to ryanair, they are the only airline who as ever managed to get me to my destination BEFORE we should have even taken off! Anyone know any good cheap all inclusive hotels? We stayed at the H10 Salou Princess hotel. 4 stars, about 5 minute walk from the beach, not bad prices, food was good (buffet - about as good as you'd expect), clean and all staff seemed pleasant and friendly. No idea what its like but the 3 star HTOP Molinos Park is £264 all inclusive for 2 people on Thomas Cook website. Topcashback of 11% brings it down to about £240 or around £17 per person per night. Bit slow as they were £17 return a few weeks ago but still a good deal! voted HOT! Don't fall for it they always need to add extras,tax,luggage etc it'll … Don't fall for it they always need to add extras,tax,luggage etc it'll add up. No extra's at all, as long as you pay by Debit Card, and just take hand luggage. MIght just have to get this! "EU 261 Levy:	2.50 GBP"
Funny how they can run flights on time and without overbooking when required to by law, so why are we paying for their incompetence? We stayed at the H10 Salou Princess hotel. 4 stars, about 5 minute walk … We stayed at the H10 Salou Princess hotel. 4 stars, about 5 minute walk from the beach, not bad prices, food was good (buffet - about as good as you'd expect), clean and all staff seemed pleasant and friendly. That interests me. How far is the drive to that hotel? Just wondering how much the taxi would set me back, but for a four-night holiday I'm thinking £300 would do me well with a small amount of spending money.